The high court’s decision to take the case is a short-term win for Texas’ Republican leaders who, in an effort to preserve the maps in question, had appealed two lower court rulings that invalidated parts of the state’s maps. If the high court had declined to take the case, Texas would have been forced to redraw the maps to address several voting rights violations. 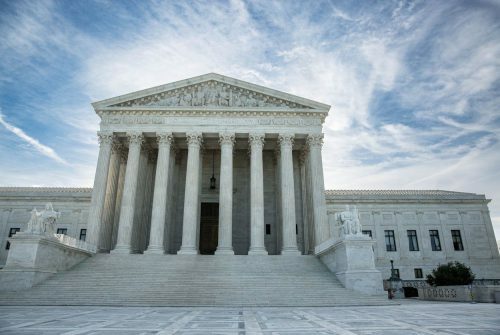 The Supreme Court’s decision to weigh the state’s appeal will further delay any redrawing efforts even after almost seven years of litigation between state attorneys and voting and minority rights groups that challenged the maps. It’s unclear when the court will schedule oral arguments in the case, which is formally known as Abbott v. Perez. In ruling against the maps last year, a three-judge panel in San Antonio sided with the voting and minority rights groups who accused Republican lawmakers of discriminating against voters of color, who tend to vote for Democrats, in drawing the maps. The state has denied targeting voters by race and admitted instead to practicing partisan gerrymandering by overtly favoring Republicans in drawing the districts. The panel specifically flagged two congressional districts and nine House districts in four counties as problematic. But the Supreme Court in September temporarily blocked the lower court rulings — and any efforts to redraw the maps — in two 5-4 decisions as it considered the appeal from Texas Attorney General Ken Paxton. The San Antonio panel had ruled in August that Hispanic voters in Congressional District 27, represented by U.S. Rep. Blake Farenthold, R-Corpus Christi, were “intentionally deprived of their opportunity to elect a candidate of their choice.” And Congressional District 35 — a Central Texas district represented by Democrat Lloyd Doggett of Austin — was deemed “an impermissible racial gerrymander” because lawmakers illegally used race as the predominant factor in drawing it. On the House side, the panel ruled that Texas needed to address violations in Dallas, Nueces, Bell and Tarrant counties where it said lawmakers diluted the strength of voters of color. In some cases, the judges found that lawmakers intentionally undercut minority voting power “to ensure Anglo control” of legislative districts. Citing the need to provide election administrators with clarity on district boundaries, the state had argued in legal briefs that the Supreme Court risked throwing “the Texas election deadlines into chaos” if it allowed the redrawing of the state’s maps to move forward prior to the March primary vote. The minority rights groups suing the state had formally asked the high court to dismiss the state’s appeal. They argued that “the right to legal districts prevails” when choosing between delaying electoral deadlines and addressing “voters’ ongoing harm” under the current maps. The state’s currents maps, which have been in place for the past three election cycles, were adopted by the Legislature in 2013. They’re largely based on temporary maps drawn by the three-judge panel in San Antonio amid legal wrangling over the maps lawmakers drew in 2011. The 2011 maps, which the San Antonio judges also ruled were drawn to weaken the strength of Hispanic and black voters, never took effect. But the panel ruled that the intentional discrimination behind the 2011 maps carried over into the 2013 maps in places where district boundaries were unchanged. In a Friday statement, Paxton applauded the Supreme Court’s decision and reiterated his outrage over the San Antonio panel’s decision to block the 2013 maps that had been drawn the lower court. “The lower court’s decisions to invalidate parts of the maps it drew and adopted are inexplicable and indefensible,” Paxton said. The high court did not act on the Texas Democratic Party’s request to revive a legal claim over partisan gerrymandering — a redistricting strategy that until recently was deemed acceptable. The high court last year heard arguments in a Wisconsin case over the limits of partisan gerrymandering and whether extreme practices can be deemed unconstitutional. A ruling in that case is pending. The court has also agreed to consider a partisan gerrymandering case out of Maryland. Hanging over the Texas case is the possibility that the state will be placed back under federal oversight of its elections laws. A barrage of court rulings last year — including the two redistricting rulings handed down last August — have forced Texas leaders to confront whether they strayed too far in enacting voting laws found to have disproportionately burdened people of color. For decades under the Voting Rights Act, Texas was a on a list of states needing the federal government’s approval of election laws, a safeguard for minority voting rights called preclearance. The Supreme Court wiped clean that list in 2013, but it left open the possibility that future, intentional discrimination could lead to a return to preclearance. This entry was posted in KRTS News, KXWT News and tagged SCOTUS, texas. Bookmark the permalink.